It is possible to improve your life by 100x? That depends on how you measure large improvements in your life. What you can do is improve your life to such a degree that your past life was unrecognizable. Here’s one way how. Step 1. Choose an area in your life you want to improve on. Step 2. Write 10 ways to improve one area of your life. Step 3. Each day write 10 ways to execute one of those ideas. And so there are two rules applied to this exercise specific to my business. Eighty percent of your revenue (or hassle) will come from twenty-percent of your audience. This applies to nearly every business. If you’re a small business owner, figure out how to best serve the top 20% (which you should love and adore, as they keep you alive), and how to get rid of the bottom 20% (which causes you problems). Trust me, that little money you give back will be a smart investment. People who complain before an event even happened are going to ruin the entire vibe. Get rid of those people! The 1,000 True Fan Rule. The math isn’t that clean, you need more than 1,000 true fans, but the concept holds. There are people who buy Gorilla Mindset in all formats, give it to friends as gifts, attend seminars, and support every project I do. They make this work possible. They are the true gorillas. Focus on the “true fans” rather than spend time dealing with complainers. Although this seems obvious, it’s not. We are hard-wired to deal with complainers. “The squeaky wheel gets the grease,” as the saying goes. Every minute dealing with a customer complaint is a minute not spent with a customer who loves you. 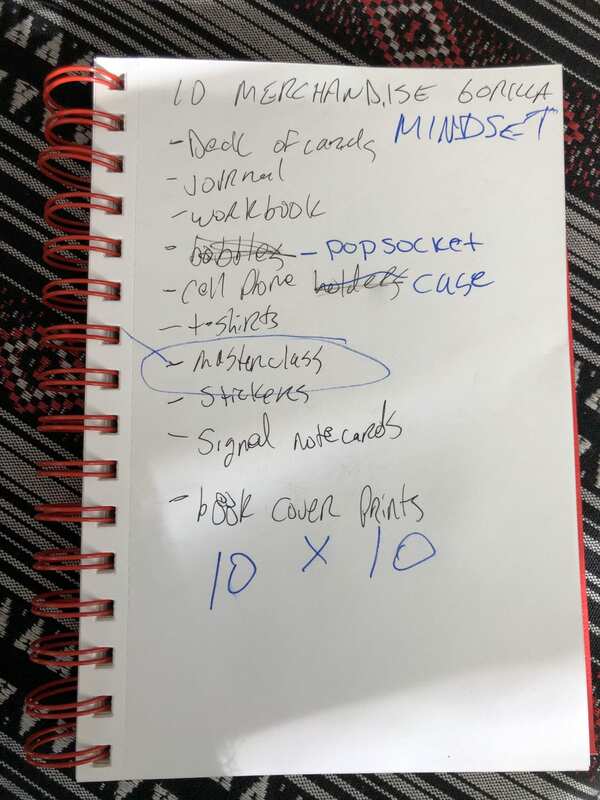 Here’s the actual journal entry for 10 Ways to Expand Gorilla Mindset. Ideas are easy, execution is hard. The magic happens when you choose one idea, and write 10 ways to improve on it, and execute on it. 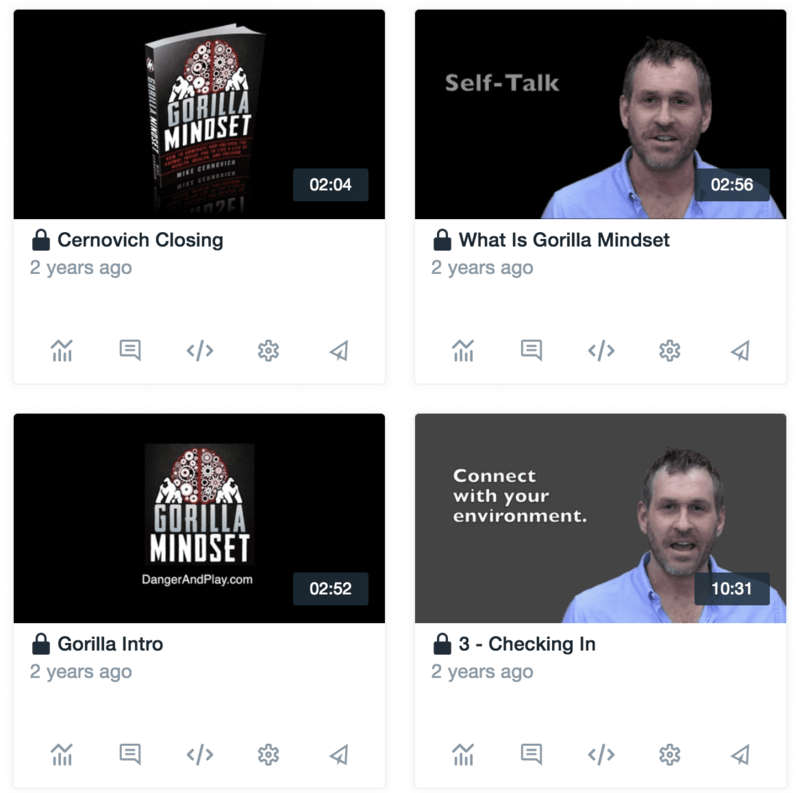 I did a Gorilla Mindset video course over two years ago. However my skin was in a flare, and given the lighting, it didn’t look good visually. I shelved the project, because if you’re going to charge for a premium product, then make the product premium. I then got too busy making a film on free speech, traveling all over the country raising heck, and lost focus on my mindset work. 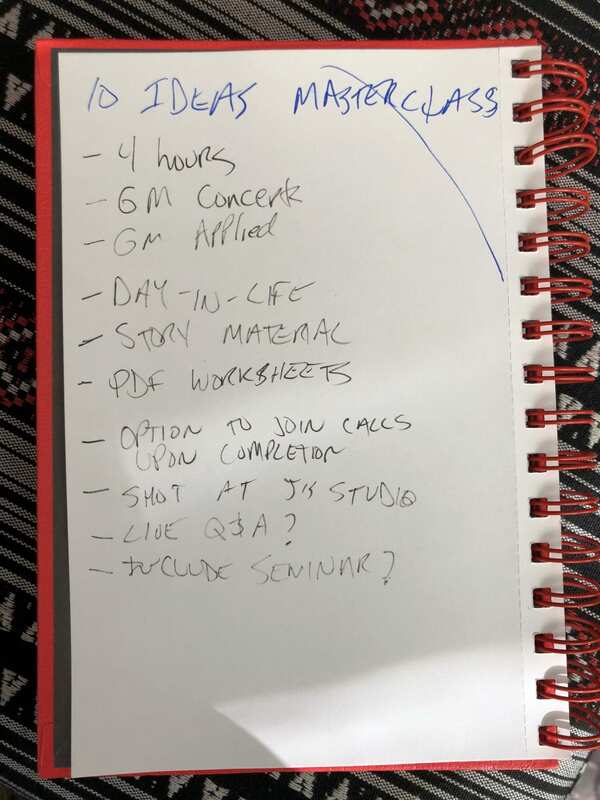 Now that “Masterclasses” are all the rage, it seems like a great time to launch my own video class. When you’re listing ideas, be a writer not an editor. A writer says yes to bad ideas, an editor says no. I am not going to make stickers or have Gorilla Mindset coffee mugs. Those are bad ideas, and they were included in the initial 10 Ideas journal entry. The editor said to focus on another 80/20 project. But a Masterclass will be a major expansion of the Gorilla Mindset life. As you go through the list, you find out what ideas will be practical to execute. And if you’re a business, focus on the ideas that will matter most to your bottom line. For example, there is no single product I can launch in 2018 that will bring in more revenue than a Gorilla Mindset class. It’s a digital product, which is a better business to be in than a physical product. You’ll have to decide what ideas to execute on in your own life. I only showed you my notebook as an illustration. I choose 100X in an arbitrary manner. If you write out 10 ideas, and build on those 10 ideas or find ways to execute those ideas, then you have 100 (10 times 10). A 100X gain isn’t as unrealistic as you think. Most venture capitalists won’t invest in a company unless they can see a 1,000X return. Grant Cardone has a book on how to 10X your life. And if you “only” 3X your life, that would be an astounding improvement. In fact, one of the biggest lessons I learned early on was to ignore or block all haters, or people who are “just asking questions.” They aren’t just asking questions. They are playing out deep emotional issues on you, and they are a waste of time. Remember: Focus on your quality clients rather than people-please nasty people. You can pick up a bottle here.